There is a Tesco Grocery code knocking around at the moment which I mentioned a few weeks ago but which is still going strong. I thought it was worth giving it another push as it is a generous one. This code is meant to be used by people who have never had an online Tesco Grocery order before. In reality, they are more generous than that. 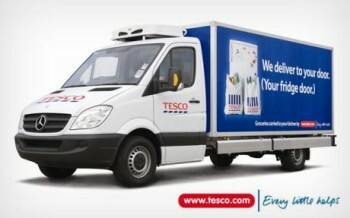 If you haven’t had a Tesco Grocery order delivered in the last year on a particular Clubcard account, it may well work. It gives you 1,250 Clubcard points for a £60 spend. There is an easy way to test if the code works for you or no. Go to the Tesco Grocery site by clicking here and quickly add £60 of items to your basket – a couple of bottle of whisky should do it. Go to the checkout page. You will need to select a random delivery date at some point in the future. You will then be taken to the payment page. Scroll down the page and you will find a box to enter a promotional code. Enter XXNNRR. If it works, you will see a confirmation message. You can then abandon or empty your shopping card. The coupon is stored on your account and will be available for use when you next place an order. I have no idea what the deadline is for using this code, but I would use it sooner rather than later just to be sure. If the code works for you, this is an easy way to bank £12.50 of Clubcard vouchers which could be worth up to £37.50 with the right Boost deal. If you don’t normally spend £60 in one transaction, consider bulking up your order with non-perishable high value items – wine, olive oil, razors, mouthwash, nappies etc! The Tesco Grocery home page is here.